A security deposit of $250.00 is also required. The $250 security deposit is required with this reservation and we will process a credit card authorization in that amount prior to your arrival. A charge may result for damage to the condo, missing contents, excessive cleaning required or for exceeding the number of overnight guests billed for in the reservation. Tampering with any equipment in areas locked off from guest use, or adjustment to any thermostat may result in forfeiture of Security deposit and/or subject to an additional fee. Removal or loss of any of the music system components will result in forfeiture of Security Deposit and/or is subject to an additional fee. Early Check-in and/or Late Check-out is subject to availability and additional cost. Any changes to a reservation are subject to availability. Any changes to a reservation are subject to an administrative fee of up to 5% of the cost of reservation, or a minimum of $35. Cancellations made more than 90 days prior to the check-in date can have the deposit applied to a stay of the same dollar amount or more, in the same Aloha Condos property within one year of the original check-in date, subject to availability. Such changes to reservations are subject to an administrative fee. Cancellations made less than 90 days prior to the check-in date will forfeit all deposits. Cancellations made less than 30 days prior to the check-in date will forfeit all deposits and rental balance due payments, i.e. all payments. Natural Disasters including Hurricane, Tsunami, Storm, Earthquake, Volcanic Activity Policy: No refund will be given unless a mandatory evacuation order has been given by the National Weather Service and/or Hawaii Emergency Management Agency for Keauhou and the surrounding area. In the event a mandatory evacuation order is issued we will refund unused portions of rent of a guest currently occupying the property and any advanced rents or deposits collected for a guest that is scheduled to arrive during the evacuation period. All reservations are subject to a check-out cleaning fee of $165.00. Stays of more than 11 nights have additional interim cleaning fees of $165.00. For example, if you had reserved the condo for 28 nights, you would be charged for three cleanings total - two interim cleanings and one check-out clean. Air Conditioning is automatically added to reservations between June 1 and Nov 1 due to higher temperatures and increased humidity that time of year. During those months, having the A/C is most appreciated at night. A pre-programmed a/c schedule is locked into the system. The program provides cooler temperature at night, and limits how warm the condo can get during the day. Guests can change the temperature on the thermostat, and the thermostat will remain at that temperature until the next scheduled temperature change time. This is done to help conserve energy. Be sure windows are closed when A/C is included in reservation. If the A/C is run with the windows and doors open, it will freeze the compressor and render the A/C unuseable until defrosted, or potentially permanenatly damage the unit. Using ceiling and floor fans with the a/c will help maintain comfort level while reducing energy consumption. Closing the blinds and curtains when leaving for the day, or during late afternoons is helpful. Guests are requested to not set the thermostat below 70 degrees. Due to the high humidity in Hawaii, setting it below this can cause damage to the air conditioner. A maximum of 6 overnight guests are allowed. With more than 4 guests, an additional fee per additional guest is charged per day. Falsely representing fewer guests than are actually staying will result in loss of all deposits and immediate eviction. Please make sure that all keys are left behind at the condo. A $50.00 replacement fee for each missing key will be charged. This condo is a non-smoking unit and no pets are allowed in the unit. Kanaloa at Kona is a non-smoking property. A fee of $15.00 for any missing beach or bath towels upon checkout will be charged. Guests shall respect the House Rules of Kanaloa at Kona, which include observing quiet hours from 10:00 pm to 7:00 am. During high occupancy periods, Kanaloa will be issuing wristbands for guests utilizing the pools to ensure guest use only. Smoking is strictly prohibited any where on the Kanaloa at Kona property. Smoking in the condo will result in full loss of security deposit. This luxury condo is as close to the beautiful blue waters of the Pacific Ocean as you can get at Kanaloa at Kona. Unit 1804 is a top-floor (second floor) oceanfront condo with over 1700 square feet of living space with all the amenities of home. The view of the ocean is spectacular providing beautiful sunset views. The private location of the condo provides a relaxing and romantic setting. Condo has been completely remodeled with quality finishes. Lanai Closet contains: Folding Beach Chairs, Beach Mats, Beach Umbrella, Boogie Board, Sand Toys, Noodles, Pool Rafts. Kanaloa at Kona, unit 1804, is a spacious and luxurious 3 bedroom / 2 bathroom condo with over 1700 square feet of living space! This redesigned and spacious layout takes advantage of the condo location to provide guests with an oceanfront lanai, living room and kitchen, as well as private bedrooms and baths tucked away from the parking lot and other buildings. The location and layout provide guests with a private sanctuary to spend a romantic holiday. Unit 1804 is located directly oceanfront on the top (second floor) of building 1800 in the northwest corner of the Kanaloa at Kona Resort in Kailua-Kona, Big Island, Hawaii. The resort grounds provide a well manicured lush, tropcial setting, adding to a true Hawaiian Island experience. This is a great place to stay. I hesitate to rave too much for fear it will become too difficult to rent every year but the owner is so nice and helpful that I feel compelled to rave. The unit itself is well laid out with plenty of space. You have everything you need in the kitchen, for the beach or whatever. The view is drop dead perfect. We saw whales and spinning porpoises every day without leaving the lanai. The area is also great. Kanaloa is quiet and has pools, tennis courts, very friendly staff and it is very well kept up. Location, location, location. You can walk to a shopping center that has a full grocery, movie theatre, stores and restaurants. There is a good snorkling beach very nearby and the Sheraton is nearby. You can also walk to a bay where you can rent kayaks and paddle boards as well as many excursion boats. There are two farmers' markets nearby and lots of good restaurants. Not much more I can say. Whales,Dolphins and Canoes, Oh My! We love Kanaloa at Kona. We have been coming to these condos for 30 years. 1804 is by far the best unit. This is our 4th stay in this unit. It has an incredible view of the ocean complete with whales and spinning dolphins if you visit in February and March. The condo is completely stocked with everything you need for your stay. Beds are comfortable and sleeping is amazing with the sound of the waves right outside your window. The grounds are well maintained and the pools are crystal clear.Our favorite lunch is to get fresh fish and grill on the gas grill close to the unit and then enjoy the best beachfront dining in Kona on your own lanai.It is hard to get this popular unit so plan ahead. We do! The condo was fantastic. Clean, comfortable, roomy and about as close to the ocean as you can be without getting wet. LOVED the sounds of the crashing waves at night. Reserved parking spot was a bit tight and the "hot tub" near the pool was merely warm and with low energy jets but those issues are not enough to detract from a 5 star condo. Beautiful place! Everything we expected and more.Highly Recommended!! Our stay at 1804 was truly wonderful. The condo is quiet, with fantastic views, and easy access to Kamehameha Rd. We like this area of Kailua because it is close to the shopping center, but away from the crowds near city center.The condo was exceptionally well-provisioned with lots of beach equipment. It was clean, and the instructions for use of all appliances and wi-fi were clear and easy to use. We plan on visiting again as soon as we can, you can't go wrong with this rental. Thanks for letting us enjoy a beautiful part of paradise. We did a lot of research before booking, and liked everything about this condo. It was great for four people but could have easily slept 6. It was clean, roomy, and well-stocked. The snorkels, chairs, beach towels, and beach mats were quite useful. The grounds of the property were clean and well maintained. It ended up being a bit far from many things we had to do, including going to the airport, the harbor, and a wedding, all of which were at least a 20-30 minute drive. THat was our fault for not knowing where things were located. Aside from that, which was not a big deal, our stay was great! You get what you pay for, and this condo was worth it. You will not be disappointed if you decide to stay here! This was a lovely place to stay on the Kona coast. The condo is absolutely stunning and the kitchen has everything you need to make a quick breakfast or a full meal. We enjoyed eating on the lanai and listening to the waves break on the rugged Kona coast. The location was perfect for us. We enjoyed a coffee farm tour snorkeling and easy access to many beaches. The community was beautiful and we really enjoyed spending one afternoon at the oceanfront pool. Gorgeous condo with prime views for ocean waves, sunsets, and stargazing. Condo was fully equipped and had everything needed to make our family feel right at home. Loved the wireless speaker system where we could connect our own music from our phones or listen to local stations. And even the ability to connect to our own Netflix account was a nice add. Appreciate the clear instructions provided for the AV setups. The mattresses were high quality/SO comfortable. We were thankful for the AC. The designated parking stall was a few car ports further away than we hoped (and a little tight for our van) but that’s a very minor nit in our overall fantastic experience at 1804. Kathy’s communication was excellent. Hurricane Lane hit the week before our arrival. She reached out to assure us that the unit was fine. She was right-We couldn’t have stayed at a better unit and thoroughly enjoyed our stay. We have stayed in this unit 6 times at least and after staying in others at Kanaloa, it is our first choice. It combines the view from the lanai, the cleanliness of the condo, the available cooking, beach and cleaning supplies and the prompt attention by Kathy of any even minor issue. She is a joy to communicate with and manages to fix anything from long distance with her contacts on the Island. The unit feels like home and we whole heartedly recommend a stay here. We had a wonderful time at Kanaloa at Kona in Condo #1804!Loved having coffee every morning and drinks every evening on the deck with the waves crashing right below us! We wanted to stay right on the water, and we were not disappointed.We have never seen a condo so well equipped! It had everything you could imagine! There were more things to use in the kitchen then I have in my own home! There were even beach umbrellas, boogie boards, water shoes, etc. The complex had 3 pools and had a very quiet and peaceful feeling. We were able to walk to the pier and take a great boat trip to snorkel at Captain Cooks monument. We would definitely stay here again and highly recommend it to anyone! Our family of four stayed in this lovely condo for 6 nights and seven days. The accommodations are exceptional. The view of the ocean is spectacular. We enjoyed sitting on the lanai and watching the waves crash on the lava rocks every morning and every evening. The location is within 10-15 minutes of grocery stores, fitness facilities, and all the acitivies we booked from the Marriott. In addition it is very close to the snorkeling beach, Magic Sands Beach, and not too far from Hapuna Beach. The condo is very clean, beautifully decorated, the layout fit our family perfectly, and having access to the the three pools was an added bonus. Kathy was very easy to get a hold of and extremely helpful. We were definitely happy with our stay and we would certainly visit again. Beautiful condo and fantastic ocean view is what this condo offers. The kitchen has every item you need to assemble breakfast, lunch or dinner. The beds are comfortable and ceiling fans offer all the cool air needed for a good nights sleep. If I visit the Big Island again I will definitely stay at the Kanaloa at Kona condo again. Our recent visit was fantastic. The condo is located next to the ocean. The place is spacious and clean. There are multiple pools around the facility. It was nice to sit out on the lanai and watch the waves after playing hard all day. We would definitely recommend this place to others and consider coming back.Thanks! My Wife and i stayed at Kanaloa at Kona for five nights in April 2018. The Condo location is inside a resort community of condos set inside of a larger community of homes and other condos making up one large neighborhood. The condo sits right on the waters edge with lava flows right below the condo lanai with the Pacific ocean waves breaking onto the lava in front of the condo. The condo is a second floor unit of 4 condos together with a stairway leading up from entrance door to the actual living space so you will need be able to lift your luggage up a fairly long flight of stairs. The condo is completely updated with everything needed for a great stay, two nice size bedrooms and two nice bathrooms , with master bath having tub, a walk-in shower with two shower heads and double vanity and makeup area to sit at. The second bath has double vanity also with single walk-in shower. The third bedroom is in a loft with twin beds overlooking den area and kitchen area with stairway. all appliance are modern and top quality with granite countertops through complete unit. Also complete with Maytag washer and dryer. There was a additional charge for Air Conditioning which is controlled by a preset program that you are unable to change since its a locked thermostat with security code to make any changes. The AC was set to about 75- 78 during waking hours and was uncomfortable for us in later morning hours, afternoon and early evening hrs when returning from sight seeing. The second day the trade winds had calmed and we noticed the AC was warm and thats when we realized we could not adjust. This was a concern before we booked this unit and we were told we could lower ac to 70 if needed but not below that temp. we contacted the owner and she insisted that we could just rotate the ring to cooler temp but that was not possible as we told her the unit was locked via a code to unlock and even sent over a picture of thermostat showing the lock and that it was set to a green leaf energy savings mode. i could understand this situation if we hadnt already agreed we could lower the temp before we booked plus we paid a extra 125.00 to run AC for 5 days. She does have many fans in the unit that helped but we arent ones to sleep at night with strong fans at night so this was not that comfortable to us. If i had been at home in our city with a ac locked at 78 degrees in the afternoon i would be calling the AC repairman to fix my AC. i do understand energy savings but also after spending 1900 for 5 nights including the extra AC charge i would expect to be able to lower the temp as needed within reason. The other issues although a bit minor were that the assigned parking for the condos were small for two cars to park together in assigned covered parking where people could barely exit the passenger side because you needed to allow enough room for driver to park and get out vehicle so you needed to let passengers out before parking. The assigned parking for this unit isnt in front of the condo although other condos are assigned parking in front of your condo. This probably isn't anything the owner can control. Its like parking your car three houses down from the house you live in. Overall we had a great time, there was nothing else we needed that the condo didnt have. The location was great and the views out the lanai were fantastic. i would have gave it 5 stars if the AC had not been a issue that she said she couldnt correct. She told us she could not get a service tech out in time to look at, but never offered the code to manually operate it either?? At the least i think we should have been offered the 125.00 charge for AC usage back, but we were never offered any compensation. Personally i believe there was nothing wrong with the AC and the owner acted like she didn't understand how the new programable thermostats worked or didnt want us to lower the temp all along and figured once we got there we wouldnt mind the higher temps!! For that reason we will not return to this particular unit again in the future. We thank Eric and Sandy for their positive comments regarding our Kanaloa at Kona Unit 1804. Regarding A/C concerns: A new air conditioning system with a NEST thermostat was installed in the past 6 months. A schedule is set in the wi-fi NEST, however, guests may adjust the temperature within a range by rotating the outer ring. Following Eric’s phone call on the afternoon of the 3rd day of their 5 day stay, we reviewed the a/c usage history, and suspected a problem with the a/c unit, as it was running 18-21 hours per day during their stay. It appeared the a/c was working, but not efficiently. The history of a/c usage during the guests stay, also indicated the guests did adjust the temperature somewhat multiple times throughout their stay. A/C service was contacted immediately following Eric’s phone call. Unfortunately, and unlike the Mainland, it is often difficult for service technicians to provide immediate or even next day service. A/C Service determined the air conditioning unit was a frozen block of ice, which required it be turned off, dried out and repaired. We ask guests to please call our local contact, or us directly and immediately with concerns, so we can respond to issues as quickly as possible. Thanks for sharing your condo with us, we enjoyed the three weeks we were there. It was clean, well organized and met the needs of our family of six very well. We appreciated the beach equipment along with the well equipped kitchen. We loved having coffee on the lanai in the mornings, watching the whales, dolphins & marine traffic. Thanks again. Enjoyed a relaxing get away right next to the ocean waves. We also toured the whole island. There is plenty to do and see so stay awhile and take it all in. We stayed at Unit #1804 for 10 days in December 2017. I have stayed at multiple units in Kanaloa and this 3 bedroom oceanfront was spectacular. The owners have thought of every convenience, as if they started with the question " What would I want in a condo?" Truly, everything from very nice bedding, towels and comfortable beds, to a fully equipped kitchen. We had cleaning service half way through our stay and she was did an equally amazing, detailed job. From check-in to check-out our experience, 5 total in the unit was ideal. The location has views both north and south and full oceanfront which I loved. The indoor/outdoor carpet on the lanai was a bonus as it muffles the noise of moving chairs. Nice for us but equally nice for our neighbors. If you need water sport equipment it's all there including coolers. Thank you Kathy for your attention to detail. We will return. This condo has a beautiful view and very close to the ocean. The kitchen was well stocked and other items were available for use for the swimming pool and/or beach. There were a few drawbacks that are worth mentioning though. The AC is governed and cannot be adjusted. We contacted the owner but basically was informed that we were to use the fans (which there were a lot of) and open the windows. This was disappointing as we paid extra for AC and could not use it to our comfort. The other item worth mentioning is that there were a lot of bugs in and around the sinks mainly in the master bathroom and kitchen. If we kept the drain plugged at all times, the number of bugs were reduced but still present. The first night was a little overwhelming. We are disappointed to receive this review as we have worked hard over the past 13 years to provide our guests with a positive experience. We do appreciate this guest’s positive comments. We attempt to be responsive to guest concerns in a timely manner, however, in order to try to resolve any concerns, we ask guests to contact us or our local contact during their stay, not after their stay. If there was an issue with insects, it is unfortunate that the guests did not inform us, or our local contact, so the problem could be resolved during the guests’ stay rather than after they left. We rely on our guests to inform us of any issues that need to be addressed. We try to take care of issues as soon as possible. The Home Owners’ Association contracts with an extermination company to deal with pest issues in the units, as well as on the property. We do suggest guests take garbage out regularly, wipe counters, and make sure food, fruit, seeds, etc are not left out to attract insects. What is interesting is that neither the guests before or after this reviewer, notified us or confirmed any insect issues, as those described by these guests. As for the air conditioning there are several factual inaccuracies in the review. 1. It is possible for guests to adjust the temperature of the air conditioner, and guests used a/c daily and adjusted the temperature down to the lowest setting (70 degrees) allowed by the system multiple times each day. The air conditioner is controlled by a Nest thermostat with a programmed schedule, which allows guests to adjust the temperature setting when they are in the condo, and assists in conserving energy when guests are not in the condo. The temperature schedule resets 4 times during a 24 hour period. Due to the high humidity in Hawaii, it is possible to freeze up the a/c system and damage the air conditioner. A minimum temperature is programmed in the schedule to prevent this from happening. 2. The claim that we told guests to open the windows is bewildering. We ask guests to please be sure windows are closed when a/c is on. Opening a window defeats any benefit the air conditioner could provide. 3. We do suggest using floor and ceiling fans to circulate air within the room to help make it more comfortable while reducing energy consumption. Despite some initial issues with the air conditioning which were resolved asap, we had a great time in condo 1804. It is in a great location right on the Pacific and is handy to everything in North and South Kona. We would definitely come back for another stay. We have been coming to Kanaloa for 30 years. We love the resort but 1804 is by far our favorite. The best view, everything you need for your stay plus the sound of the waves crashing out your lanai. Heaven!!! We will be back! The condominium was exactly as displayed online. A beautiful lanai with ocean views, nicely appointed interior, clean, and comfortable. We've never stayed in a place that was so well outfitted with beach chairs, snorkel gear, kitchen stuff, and thoughtful little things (dish soap, trash bags, sponges, etc). The beds were comfortable and the A/C worked great. We hadn't fully appreciated that the 3rd bedroom is a second floor loft, but it was reasonably quiet and private. There is a little shopping mall only a few blocks away with grocery store, movie theater, and restaurants. Overall, a terrific stay in a lovely accommodation. And Kathy couldn't be more helpful and accommodating. This is a wonderful place to stay on the Big Island. The location can't be beat, right on the ocean. We enjoyed waking up each morning, having breakfast on the lanai, watching the outrigger crews practice while hearing the waves crash against the rocks. Our grandchildren loved the pools and tennis courts. They also loved their bedroom in the loft; they felt like they had their own secret place. The condo is attractively furnished and completely stocked with anything you would need. The master suite is large and the master bathroom is huge and luxurious. Stores and restaurants are nearby. The entire complex is attractive and amazingly quiet. We would definitely recommend this unit and actually already have told friends about it. Not many condos in HI have A/C, and the ones that do naturally charge a premium for it. The A/C in this place was ICE cold and cost an extra $15 per day. I was worried that the thermostat would be set high like 80+, but in the evening, when it was needed, the setting was 74! I had to turn it up a little - not complaining of course, the air was very comfortable, and we both slept as well or better than at home. Regarding the other aspects of the condo everything was just about perfect. 1804 has a 180 degree view of the ocean from Kona town to the Sheraton, and the surf is literally a stone's throw from the lanai. There was lots of room inside for the 5 people staying. Kitchen was well equipped. Just about everything in the condo was in good condition; only exceptions being I hate cooking on an electric stove (but it did work fine) and the under cabinet lighting didn't work, or I couldn't find the switch. Not a big deal, but my son complained about too many lights on in the kitchen when he was sleeping in the loft bedroom - the under cabinet lights would have alleviated that if working. Only other niggle is the fridge indicated the water filter needed replaced. Master bedroom is very nice; huge master bathroom with double shower. This place is great for a family or even 2 to 3 couples staying together. The condo was everything the photos present it to be. Beautiful ocean front location, very comfortable and well stocked unit. We had three children and three adults in our party and were very appreciative of all the beach equipment provided for snorkeling, boogie boarding and a pleasant day at the beach. Additionally, we cooked dinner in the condo most of the time and found the kitchen very well stocked. We enjoyed the lanai every night for the spectacular sunsets and the kids really enjoyed the ocean front pool. Lastly, I will say Kathy George was so very responsive and very pleasant to work with throughout the time leading up to our stay. I would definitely rent unit 1804 again the next time we go to the Big Island. We had a very nice stay at Condo 1804, all was neat and clean and very comfortable. We enjoyed the beautiful setting, including the multiple swimming pools and the tennis court. The great restaurant just up the hill that overlooks the sea was a nice adder. Don't forget the ease of driving down town along a beautiful route in view of the ocean most of the way. We only had 4 nights in the Kanaloa 1804 in January 2017. The condo was well stocked for visitors. We loved the fact that you even had great knives - those are often non existent in vacation rentals. The Ocean view from the bedrooms, living room and lanai were spectacular. The condo was clean, and comfortable and was perfect for us. Close proximity to one of the barbeque areas as well. We have stayed at the Kanaloa in a few different units over the past 4 years and 1804 is certainly one of the best! Wonderful location, very well appointed condo, everything was exactly as advertised. No surprises at all. We would stay here again and highly recommend this rental. Great place! Love it here! Only problem was air conditioning again this year but staff if very helpful and quick to respond. We have stayed in this condo for the past 3 years and it is great. It is right on the water so you can sit on your Lanai and watch whales and dolphins and remarkable sunsets. The owner keeps it in great condition and the cleaning service is great. The condos are within walking distance of shops, restaurants and movies and not far from a great snorkling beach and place to rent kayaks and paddle boards. The property is kept in excellent condition, there are three pools including an adults only pool as well as tennis courts. The staff is very friendly and helpful. I highly recommend this place for a great vacation. A college friend and I stayed at this condo for almost two weeks over the year-end holidays. It's a spacious place right over the water and within walking distance of Keauhou Bay. It's so spacious that we only used two of the bedrooms, the third one upstairs was left unoccupied. The master bath is more than huge. The kitchen is well laid out and stocked with all the necessary utensils and cookware. I cooked every night and had almost everything I needed. In fact, I would like to compliment the owner for her thoughtfulness in how she furnished and equipped the place. Whatever we needed, we ended up finding it. Together with the excellent location, this made for a very pleasant stay. This condo has probably the best location on the property. We have stayed at two other condos and liked them but the view and sound of the ocean cannot be beat. It was a stay with my 86 year old mother and my daughter and son in law, along with my husband. The only problem I can see is if someone has a knee or mobility issue. There are 25 steps to get to the main floor. The condo is large with the standard amenities. Nice lanai which we almost never left because of the view and crashing surf.The second shower head in the master bath was not working and the spa tub did not work as well. Not much of a problem. Overall it was a great place to stay for 9 days. We had such a wonderful time in Kona. The views from this condo were breathtaking and I enjoyed every morning on the lanai with my coffee, listening to the waves. The condo is equipped with everything you need and minutes from one of the best snorkeling beaches and other great beaches. We enjoyed every moment and can't wait to return! The condo was awesome and the complex was very nice. We loved the 3 pool options and loved being in a condo residence, rather than a resort. We mostly had the pool to ourselves. We had one minor mishap with the screen door not opening, but the maintenance crew was very quick and attentive and got it open in no time. Thanks for a wonderful vacation! Incredible view, incredible condo, incredible location.The view was such a treat to have. The waves crashing at your door, watching all the boats and ships, kayaks, and the wildlife. The Sunsets, oh the sunsets!! The condo was so comfortable and big. You WILL need the air conditioning!!! Great furnishings and every thing you need for cooking. We were smart and went to the condo BEFORE we went shopping. The condo offers so many cooking spices, oils, some food, coffee for a few days. The KTA Grocery Store is right up the street. We'll definetly be back to 1804. Thanks so much for a stress free vacation!!! "No way" was the first thing one of our sons said as we entered the condo for the first time. It was very spacious and comfortable, and we ended up spending a lot of time on the lanai just listening to and watching the surf smash against the rocks beneath us. There were two couples, each with their own bedroom, and our son had his own bedroom up in the loft. The air conditioning was quite nice, and we never had to adjust it during our 8 day stay there. There are three pools on the property, though we only used the oceanfront pool and the one closest to us. They were quite refreshing, and the spas were also welcome. The tennis courts are quite close, though we did not use them. A couple of suggestions for people who rent. If you want to drive over to the volcano via Hilo, the road over Saddle Point is really quite good now. If you're consulting slightly older guides to the Big Island, it may say that it's not a good road. Just the opposite. Except for a quarter mile of road being worked on just outside of Hilo, the road over Saddle Point is probably better than any other road on the Big Island. Most of it is part of the Daniel Inouye Highway. It's a lovely drive and much shorter (and safer) than going the southern route, especially at night. Also, you should note that all of the snorkel equipment, etc., in the storage off the lanai are leftovers from other renters. None of it is very good, and you're much better off walking or driving up to the Keauhou Shopping Center and buying inexpensive snorkeling equipment at the CVS/Lonn store there. In addition, there is a KTA shopping center there to buy food and beverages. There is also an Urgent Care Center there, but they don't accept insurance cards. You have to pay cash and then bill your insurance for reimbursement. As for places to snorkel and body surf, we would recommend Two Step as the first choice. It's near a National Park to the south. Closer in to town is Magic Sands. Much better for kids and adults not wanting to slice open any part of their bodies on the rocks. Finally, in town and near the pier, is a lovely area (with a nice park) where you can swim without having to deal much with the rocks. Not a lot to see if you're snorkeling, but little kids might like it. To give you an idea of the area, it's a place where swimming teachers work with little kids. You can't really go wrong here. The unit faces the ocean and you can hear the crashing surf even when the windows are closed. The lanai offers views up and down the coast and is very comfortable, as is the rest of the unit. It's all freshly appointed with all the comforts of home and all the kitchen and bathroom facilities in good working order. Beds were comfortable and beach towels were provided. Upstairs loft got a little warm even with the AC on, but the ceiling fans throughout the unit helped. A grocery store is a short drive away if you want to cook while there. Our only disappointment was that we had to leave early due to an impending hurricane, but we would definitely stay there again if we returned to the Big Island. We were planning a getaway and have never been to the big island before. I must say our trip was amazing! This condo is true to form with the pic's and was very comfortable for our family of 5. The views outside off the lanai are breathtaking. We did encounter a few glitches regarding a brief power outage as well as some cable/internet coffee maker difficulties. I have to say Kathy the condo owner answered our calls at all times of the night and day and tried to make everything right ( even if it was out of her control) I would highly recommend this condo and location. We were close to everything including the marina just down the street for an amazing boat excursion. Cannot wait to return!! We had another great stay at this awesome condo. It is so well appointed and has such incredible views. We always hate to leave and cant wait to come back to stay at unit 1804! This was our 3rd stay in 1804 and we are ready to return as soon as we can. Everything was clean, fresh, comfortable and well furnished with necessities including birthday candles which we used !It was so convenient to have paper products, garbage bags, laundry detergent, sunblock ,fins and masks,beach mats,condiments, chop sticks,seasonings, oils and vinegar and mbasically just about all the staples you need to cook and enjoy the unit and the complex. What a perfect way to start the day with a cup of coffee overlooking the crashing waves. The only thing better was watching the beautiful Kona sunsets while sipping a glass of wine.......all this from the comfort and privacy of our lanai. Aside from the perfect views the condo was lovely, well maintained, stocked with anything we could possibly need, and perfect for our group of 3 singles. (It would also be an excellent choice for a family.) The entire process from reservation to check-out was smooth and easy. Thank you for a wonderful experience. Another great stay at Kanaloa. Huge waves to watch this year and big sound to go with it. Relaxation at its best! We stayed in this condo for several nights and found it to be well-appointed, very comfortable, and spacious. It was perfect for two couples traveling together. The location was also perfect: a quick drive to grocery store and nearby restaurants, yet far from the congested areas of Kailua-Kona. It's within walking distance of several companies that offer snorkeling and other water activities. The view of the ocean from the livingroom and lanai was spectacular. We watched huge waves, whales, dolphins, and beautiful sunsets without ever leaving the condo! I would highly recommend paying the extra money for the AC as it can get pretty warm and humid so close to the ocean. Our stay at #1804 met or exceeded all our expectations. For views of the bay from a lanai, this unit seemed to us the best in the Kanaloa at Kona resort/condo complex, as it appears to sit furthest out on a point that provides what is probably at least a 180-degree view. There are only about 30 or 40 feet of volcanic rock between you and the sea, and the sound of the surf at night made for a great night's sleep. The condo is spacious and beautifully maintained. The complex offers a very nicely landscaped and quiet ambience far from the traffic of main roads. It is about a three- or four-minute drive up the hill to a very nice small shopping center with good grocery and drug stores, a bank, a couple of excellent restaurants, gas station, and more. We found the description of the unit and the extensive list of amenities presented on the website to be completely accurate. The concierge for the complex was pleasant and very helpful. Kathy, the owner/agent, is really on top of things and was flawless in answering all our questions and providing exceptionally good instructions as to the whole rental process, arrival/departure arrangements, etc. Prior to our departure for Hawaii, she was always prompt and very helpful in responding to any questions we had. Our arrival at the unit after the long and tiring flight from Phoenix went like clockwork. And, best of all, nothing went wrong during our stay! (Well, OK, there was a burned out light bulb in a table lamp.) We were sad to leave, and we would love to return to the big island. If we do, #1804 will definitely be where we will want to stay. Such a nice place. The views are simply stunning, from the morning sun splashing light on the shore from behind the condo to front row seats for glorious sunsets at days end. The condo is spacious, nicely updated, very clean and well appointed with everything you need. The Kona coffee waiting for us was also a very nice touch. The owner Kathy was also easy to work with...very prompt communication and clear instructions from booking to arrival to departure. Enjoy! This was our 3rd trip to Kona and Kanaloa. Each time every unit has been spotless , up to date,and ocean front, This unit is equipped with everything you need for a perfect stay right on the water. The property is off the main drag so it is quiet. The staff we ran into were excellent. The shopping center for groceries is right up the hill and many of the fishing and snorkeling activities are located in the nearby harbor.The local farmers markets provided us with local fruit and handcrafts. Amazing condo with amazing views! This condo is perfect!!! Great location away from town-but still close and amazing views! We enjoyed our stay here very much and loved the sound of the ocean-that you can hear even with the windows closed. We spent many hours on the balcony watching the waves crash and watching boats go by. One of the reason's I picked this condo was because it had air conditioning. It turns out- we needed it!!!! It was extremely hot and humid during our visit and the air was perfect. The other reason was the location and views. AMAZING!!! This place had everything- from beach supplies to a washer and dryer. We hated to leave!!! !Thank you for sharing your condo with us! We hope to visit again one day! We cant't wait to return! Kanaloa at Kona unit 1804 was much more than we expected! It was beautifully decorated but felt comfortable and inviting. My husband and I were traveling with our 15 year old daughter and my 80 year old mother and we all felt right at home. It is a 3 bedroom, 2 bath upstairs unit and the balcony is RIGHT on the water. The sound of the waves crashing on the lava rocks is so soothing that we had a hard time ever leaving the condo. The condo is equipped with everything we needed for beach time: beach towels, chairs, boogie boards, snorkeling gear, even sunscreen! And the kitchen had everything we needed to prepare meals. Kathy, the owner, was very accessible and responsive to my questions before our arrival. We checked in with the security guard who was very knowledgable and helpful. The complex is quiet and beautifully maintained. Although the condo is right on the water, it is on a rugged stretch of lava rocks with no beach access. The nearest beach however, is only about 5 minutes drive away but you definitely need a car. There is a shopping center very nearby with a Long's Drug Store, grocery store and several restaurants which we found extremely convenient. We were all so sad to leave on our last morning and are already dreaming of our next trip. We would love to stay at this gorgeous condo again. Kanaloa at Kona unit 1804 was much more than we expected! It was beautifully decorated but felt comfortable and inviting. My husband and I were traveling with our 15 year old daughter and my 80 year old mother and we all felt right at home. It is a 3 bedroom, 2 bath upstairs unit and the balcony is RIGHT on the water. The sound of the waves crashing on the lava rocks is so soothing that we had a hard time ever leaving the condo. The condo is equipped with everything we needed for beach time: beach towels, chairs, boogie boards, snorkling gear, even sunscreen! And the kitchen had everything we needed to prepare meals. Kathy, the owner, was very responsive to my questions before our arrival. We checked in with the security guard who was very knowledgable and helpful. The complex is quiet and beautifully maintained. Although the condo is right on the water, it is on a rugged stretch of lava rocks with no beach access. The nearest beach is only about 5 minutes drive away but you definitely need a car. There is a shopping center very nearby with a Long's Drug Store and several restaurants which we found extremely convenient. We were all so sad to leave on our last morning and are already dreaming of our next trip. We would love to stay at this gorgeous condo again. We enjoyed this condo immensely! It is comfortable, clean & the views are incredible! The beds are so comfortable! Watched spinner dolphins while my kiddo napped! We will come back & we've told many friends about this gem! We loved that we could walk up to the shopping center for groceries & a few good meals! This is one of the nicest condos we've ever stayed in. The condo itself is beautiful, well appointed, well stocked kitchen, fabulous huge bathroom, comfortable everything. But seriously - this view beats just about anything I've ever seen. It feels like you are on the bow of a ship. You can't see anything but water (and some lava rock, which makes it all the more beautiful! The whales swim right by! The sunsets are gorgeous. I fear for any visit to any other Hawaiian Island (any trip to the Big Island will be to this condo) because it will surely be impossible to match this view. And to top everything off, the location is fantastic - easy access to grocery shopping, shops and restaurants. Condo 1804 at Kanaloa was exactly depicted in the photos of this listing. It was very clean, well appointed and very nicely decorated. We enjoyed sitting out on the lanai and watching the waves crash against the shore. Because of the close proximity to the ocean, it can get a little loud if there is a storm but we found it relaxing. We often would see whales spouting off in the distance. The sunsets were absolutely amazing. I would definitely stay here again. We did have an issue with the refrigerator while we were there and the owner was very responsive. Once again we had a great time at "Kathy's" place. The condo had all we needed from very clean and comfortable rooms to well appointed kitchen. All the comforts of home with added sound of waves, spinner dolphins and the occasional whale breech. What more could you want - oh right - the three pools and beautiful grounds. Not close to a beach but with the lanai - who needs one! We had a great time at this condo. It was beautifully furnished and had great space. The view was spectacular and we saw whales every day right outside our window. The condo complex has a number of pools and bbq grills for tenant use. It was quiet and in a great location. We could walk to a shopping center with a grocery, restaurants, movies and shops. A terrific snorkling beach was a short distance away and there were lots of places to take walks in the area. The owner was very accessible and accommodating and we will certainly try to stay there again. We had a Great Time, the condo was really nice! We really enjoyed staying at your Condo, it was clean and perfect for my family, the kitchen needed more spices, and more paper towels, but overall we liked it a lot, it he location was perfect, we enjoyed the pier and shops close, it was nice looking out to the ocean and seeing the whales, and dolphins. If we come back to Kona I would rent this Condo again! We (middle-aged couple) rented this condo for eight nights. The VRBO pictures are accurate - condo is right on the rocky coast with unobstructed views of the ocean. We watched the crashing waves and various boats every morning and evening. The views were just as fantastic as we anticipated. The condo was very clean and spacious. Besides the lanai, one of our reasons for choosing this condo was the hard floors - wood and tile. We do not like carpeting in the humid Hawaii weather. The floors were clean. We also chose the condo because it has central A/C. We live in a dry climate and prefer the A/C when in Hawaii. The A/C worked well enough in the back of the condo where ceilings are 8' high or so, but not so well in the high, vaulted ceiling of the living room/dining room/kitchen. Fortunately, we were there in cooler weather. I would imagine that the west-facing living/dining area would get quite warm in warmer weather even with the A/C in use. The biggest drawback to the condo for us was the quality of the master bed. The mattress was too soft for our liking - my 225-lb. husband felt that he 'sank' into it too much. I also felt is was too soft for me. I have back problems and need a firm mattress. We both had backaches from the bed. In addition, the bed frame itself is terribly creaky, so that when one person moves, rolls over, gets up, etc., the bed makes a LOT of noise. Every time my husband arose, I was awakened by the noise, no matter how hard he tried to be quiet.. It was just impossible to get out of bed quietly. We experienced some other problems with basic services in the condo. On the first morning we had to call the local contact as there was no hot water in the condo. He explained how to reset the water heater. We had to do this procedure about every two or three days during our stay as the water heater would shut off. We were not sure if this problem with the water heater was related to the temperature of the water in the master bath, but when the hot water was working, it was dangerously (i.e. scalding) hot. The single-control dial for each of two shower heads were very hard to figure out as to how to set the shower temperature. It took a lot of fiddling each time with the single temperature and pressure control to get the water temperature and pressure correct for a a shower. We could not even choose the same position for each shower dial every time we showered - the temperature seemed to change dramatically. As another reviewer noted, the bathtub jets no longer work (which wasn't a problem for us). Also, the stove top had one burner not working with a note that the unit was to be replaced soon. We operated fine without it. There was one burner not functioning on the cooktop (with a note stating that it would soon be repaired), but that did not affect our ability to prepare meals - three other burners were sufficient. The owner supplied several beach towels, coolers, chairs, and an assortment of other items, which was much appreciated. We asked for a late check-out (1 hr) and were granted four hours (but we didn't need the extra time) as there was not a another tenant due to arrive on our check-out date. If you are a avid TV watcher, you may be disappointed in the selection of TV channels. It was very limited but since we weren't in Hawaii to watch TV, it didn't really pose much of a problem for our short stay. If you wanted to rent this condo on a long-term basis, you might want to negotiate a better cable TV package with the owner. We appreciate prompt and constructive guest feedback which alerts us to items needing to be addressed as that is usually the only way we know a problem exists. It is most helpful if guests notify us immediately and directly of any concerns they experience so they can be resolved. We regret any inconveniences experienced by this guest, or any guest, but hope the overall experience of their visit to the Big Island was enjoyable. Due to limited inventory on the Big Island and distance to the Mainland, repairs can often take longer for completion than one would like. The water heater thermostat issue was unknown to us prior to this guest. Upon learning of the thermostat problem from our cleaner, we scheduled to have a new water heater installed and that was completed 12/22/14. The cracked stovetop was caused by a prior guest. Parts had already been ordered and were installed as soon as they were available to the repairman, and condo was available. (Completed 12/15/14). We schedule maintenance checks for our a/c equipment regularly. There are window coverings in the condo to help reduce the heat caused by the late afternoon sun as the condo is oceanfront and provides direct viewing of sunsets. Ceiling and floor fans are provided to help maintain guest comfort. The mattress referred to is a memory foam mattress, and relatively new. Unfortunately, mattress comfort varies so much from person to person. We have also had guests report how comfortable it was for them. We will continue to monitor this and review for future replacement. Regarding the bathtub jets: We have repaired the jets multiple times, and continue to have reoccurring problems due to guest misuse. We will continue to evaluate this situation. Basic Oceanic/Time Warner cable TV programming is provided through the resort property association and we have not had any complaint prior to this. We do encourage our guests to contact us with any questions or concerns so they can be resolved. Our stay at Kanaloa 1804 was delightful. Condo was elegant, comfortable and well stocked. Decor and furnishings were very tasteful and higher quality, which we appreciated greatly. Lanai furnishings were better quality and more attractive than the Mauna Lani resort we stayed at after our Kanaloa time. High quality linens and towels, multiple fans in every room, stocked kitchen and laundry, beach equipment, luxurious bathrooms and showers...just perfectly delightful. Our stay could not have been better- except that it was very hot and humid that week. Very comfortable, lots of kitchen and laundry supplies and water toys. The location is so convenient to shopping, snorkeling and the harbor where Dolphin Discoveries goes out of. Loved the direction of the lanai view, we even got to watch the big canoe race right past us the last morning. The only surprise was the mongoose munching on the grill when we opened it up! Had to cook our fish in the oven that night, but it now makes for a good story! This is a very comfortable 3 bedroom unit. It is right near the ocean and you can hear the waves crashing which is so relaxing. Spent a lot of time on the lanai watching spinner dolphins and activity. Perfect way to start the morning with coffee. The owners were very thoughtful and the unit is well appointed with condiments, spices, snorkel gear, boogie boards and other nice touches. There are stairs to the unit and to the upstairs bedroom with twin beds if stairs are an issue for you. Only 4 beach towels so bring some if you have more than 4 people. There is a wonderful grocery store and drug store right up the hill. This condo worked perfect for us as my daughter was getting married in the Sheraton so it was very close by. The grounds are lovely, it was peaceful and quite. The kids enjoyed the pool. This isn't a location you can snorkel or swim in front of the unit but has a nearby beach.Remember you have to tell them to turn the air conditioning on before you get there if you are going during the hotter season. My only complaint was the jetted tub didn't work and obviously hadn't for some time based on the sign. They really should put that in the description of the unit. Ironically I chose the unit for that jetted tub and was disappointed that it didn't work. The dishwasher also didn't work but a part was on order. The beds were okay, not great. Everything else seemed fine. Our family has stayed at the Kanaloa condos for many years, so we have had several places to compare this location to. First, we realized that the air was essential this time of year, and because it was on the second floor. We were so excited to find the condo decorated well, had super comfy beds, and furniture. The master bed and bath was amazing, I wanted to take the dual head shower home with me. Our lanai looked out onto the water, and the sunset views were spectacular. The only issue that was a little disappointing was the lack of spices, or condiments in the unit. Other places we have stayed stocked the cupboards with more options so we did not have to purchase them for a weeks stay. Overall, we will return soon to this lovely condo. Mahalo! This condo was very clean and very comfortable. The view is wonderful. Being right on the water, we didn't miss a thing. From the whales and spinner dolphins to the reef fish we could see in the waves. We had some rainy days but didn't mind...we sat on the deck and read and watched the huge surf crash onto the rocks. This is a very nice spot to spend a Hawaii vacation. I chose this unit for the view, and it really delivered! Oceanfront perfection. We spent a lot of time on the lanai watching the waves, perfect sunsets, moonsets, and sometimes even surfers and migrating whales. The lanai looks mostly to the west, and there is also view to the north. The condo has great furniture, both inside and on the lanai. The kitchen had all the appliances, cookware, and dishes that I needed. There are some water recreation supplies provided, too: Boogie boards, snorkel masks/tubes/fins, some water shoes (and they were our size, perfect). There are community grills throughout the complex if you like grilling your dinner. We didn't use these on this trip, but I have stayed in this complex before and the grills are convenient and well kept. The complex has three swimming pools; our favorite is the oceanfront pool. There is no beach at the complex, but we knew that and there is a wonderful beach (Kahalu'u) a short drive away for easy amazing snorkeling. This is also a short drive from Keauhou Shopping Center, which is very convenient for groceries at KTa, and sundries at Long's Drug Store. Right from the decision to rent the condo through to the follow-up after departure, everything was handled quickly and professionally by Kathy. The condo was exactly as depicted in the pictures and easily accommodated five adults. It is obvious that it has been well maintained and definitely qualifies as a high end property. More than that, it felt like home from the minute we walked in the door. The kitchen easily accommodated two cooks, was well stocked and very functional. The beds were super comfortable and the ceiling and floor fans ventilated all rooms throughout our stay. When not travelling around the Island, we enjoyed the three pools on the property, and particularly loved the views and breezes from the lanai. The lanai had a bar fridge, which was very handy, and was the ideal location to view the magnificent sunsets and enjoy our meals. We would have no hesitation in renting this condo in the future and would highly recommend it to anyone who wants a little bit of paradise right on the ocean. Our stay in 1804 was "Brilliant" - The unit is wonderful with spectacular views and a beautifully decorated interior. The furnishings were not only pleasing to the eye, but comfortable as well as functional. 1804 is situated in the Kanaloa complex in such a way that once we entered the unit it felt like we were the only unit in the condo complex and with views of the ocean and sunsets that defy description. The layout of the unit provides comfort and privacy for up to six people. The 3 ring binder provided all necessary information about the unit and helpful recommendations about shopping, dining, and touring. Also the various Tour guidebooks that were available in the unit were helpful. We have been coming to the Big Island for about 20 years and have stayed at Kanaloa at Kona at least 7 times - This was by far our best experience and none of the others were bad. When we return to the Big Island we will definitely try to stay in unit 1804. Kathy George's communications with us before our visit and helpful manner made us feel comfortable and confident that our experience would be first class, and it was. This was a wonderful experience for our family. Clean facility and very well kept. This is a great location in Kona. We have stayed in Kathy's condo 1804 four times now and it's a better experience every time! Impeccablly clean, everything always works and the responsiveness and class of the owner, Kathy, is beyond description. I can say this with conviction since I've been in the real estate business 22 years. 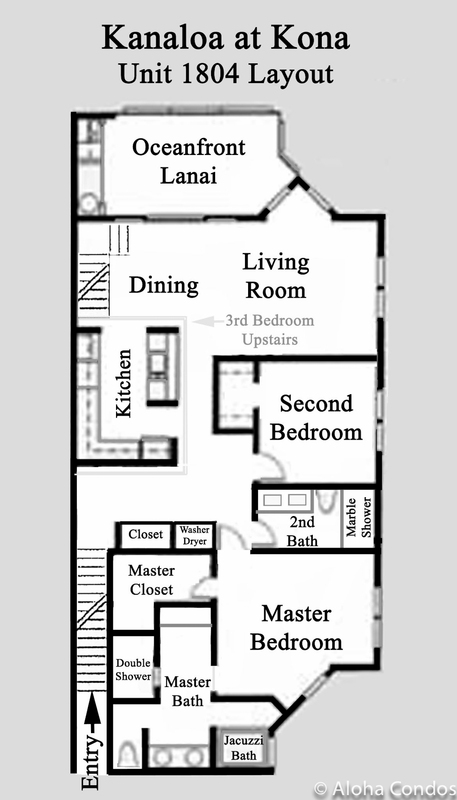 The condo itself is located in the Kanaloa property in the Keahou area, just 5 miles south of town in Kailua Kona. Right on the rocks overlooking the blue Pacific with just enough breaking waves for incredible peace. We've visited all the islands of Hawaii and I can honestly say Kanaloa at Kona is the nicest condo property and Kathy's 1804 is the best of the bunch. We'll be back again! This gem of a condo is located in a beautifully maintained, peaceful resort. A great home base for exploring the Kona side of the Big Island. We had plenty of space, and found the condo to be clean, comfortable and very well maintained. It was a pleasure to cook our own meals in the clean and well equipped kitchen. The in-suite washer and dryer were fantastic, and much appreciated after some long hiking days in Volcano National Park! The views from the lanai were incredible, and we were treated to a show by spinner dolphins every evening around 5:00 p.m. We never tired of watching the waves crash against the shore. A short walk to the nearby blowhole also proved very entertaining! We would highly recommend this spot to anyone. Kathy was wonderful to deal with; always prompt and professional. Mahalo! This was our third visit to Unit 1804It is a perfectly located spot in a quiet yet well serviced area of the Big Island close to Keahou Bay.The owner and manager have always responded quickly to any questions.The beds are comfortable, the condo is very clean clean and completely updated.We wouldn't hesitate to return. We don't look forward to the day when the run of stairs up to the unit prove too challenging. Lulled to sleep at night by the sound of the waves. Stunning view from the Lanai - perfect for daily Whale watching. Beautiful, well cared for resort. Condo is exactly as the pictures online display. All supplies we could need especially for beach days - umbrella, lawn chairs, coolers. This was our first visit to Hawaii and the home away from home comfort of this condo along with our generous host's hospitality (Kathy) - a return trip is already in the works ! An ultimate place to celebrate a significant birthday (or any occasion). Waking to sun, birds and the beauty and awesome power of the waves that are only 20' feet away, with a cup of 100% Kona coffee and fresh papaya is an amazing way to start a day. The condo is beautifully furnished and had everything we needed. Our favorites were the lanai, the beautiful bathrooms and comfortable beds. We appreciate being able to use the provided beach chairs, towels and boogie boards for our visits to Kua Bay. A special memory is watching a large group of Spinner Dolphins frolicking from our lanai. We also were entertained by the stand up paddlers, outrigger canoes and kayaks daily. But, truly nothing compares to the incredible sunsets! Wow!!! We watched daily from the lanai and have many photos to preserve our memories. We highly recommend the zodiac snorkel trips with Sea Quest (a short walk from the condo), visiting Volcanoes National Park and the Black Sand Beach, paddling with Keauhou Canoe Club (donation), Kua Bay for boogie boarding and Kahalu'u for wonderful snorkeling (.5 miles from condo). But, don't forget to plan time just enjoying the view from the lanai.This condo is in a beautiful setting and definitely felt secure. We highly recommend renting it. It's clean, well maintained and beautifully appointed. We look forward to our next trip. Mahalo! We loved our stay. The condo was tastefully decorated and very comfortable. The location is excellent - right on the water with stunning views. The owner kindly allows you to use beach accessories such as towels, chairs, boogie boards and coolers. It made for some great days at the beach. The complex offers 3 pools/hot tubs and 2 very nice tennis courts. The location in Kona affords easy access to shopping and dining. I would not hesitate to stay here again. We loved our time at Condo #1804. It was right on the rocky beach and we enjoyed wonderful waves and beautiful sunsets. Loved sitting on the Lanai and watching the boats go by. We even played cards out there. The condo has everything you will need for a great stay and is located close to a small shopping center that has a grocery store. Also, Kathy the owner, was very accomodating! You will not be disappointed! Booking communication was excellent, with timely emails. Payment transactions were smooth again with good communication. Clear instruction on how to find the property were included.The condo was wow - right by the sea, with the lanai opening onto the sea crashing against the rocks. The condo was comformable and was well equipped and an arrival pack of essentials was supplied. On site were 3 pools all well kept as were the grounds. A short drive to the supermarket which was very convenient. The location was quiet and we saw dolphins from the lanai. The concierge was available for advice on excursions and were knowledgeable. All in all a great vacation. Our group of four adults stayed in the condo for four nights in mid-July. Our only disappointment was that we couldn't stay for a month or more. The condo was beautiful, extremely comfortable, clean, and well maintained. The listing is entirely accurate....Kathy was responsive, professional, and easy to work with....Being right on the ocean, the view was spectacular, and we were blessed with more than one gorgeous sunset. The surf on the lava-rock shore lulled us to sleep every night....The kitchen was clean and well stocked. The goodie basket awaiting our arrival was a very nice touch. We were also really grateful to have the washer and dryer in the unit. We used it the last night of our stay before transferring to another island....I think we may have used the a/C once or twice during our stay, but most of the time the trade winds took good care of us. And it was great to have wifi in the unit....The master bath is over the top, especially the huge shower. Loved it! There was a note on the Jacuzzi that the jets weren't working, but this wasn't an issue for us since it really wasn't hot-tub weather (is it ever in Kona? )....We spent a day on the North Kohala coast, zip-lining and hiking, and another day exploring the volcano and hiking the Kilauea Iki crater. Highly recommend both. Also drove up to the Mauna Kea visitor center for a bit of stargazing; the Milky Way was breathtaking....Bottom line, I would absolutely recommend this unit to friends and family, as long as they're not trying to book it for the dates I want. Beware - once you enter, you may never want to leave. That's what happened to us. The lanai right on the water was so relaxing that we spent lots of time there. With the overhead fan and light, it could be enjoyed at any time of the day or night - we were treated to a full moon the first night. The resort property itself is beautiful, quiet and has 3 pools. We were looking for a stressless vacation and we got more than we could dream of!The condo was immaculate with a fully equipped kitchen. After loading up at Costco (on the way to the condo from the airport), there was no need to go out to eat. Remember to check out the blue binder on the table next to the sofa. It is full of info about the area with menus for nearby restaurants. The best part for us were the step-by-step instructions on how to use the DVD player (with surround sound, no less).Kathy, the owner, is very gracious and provides helpful info and suggestions. She responds to your e-mails quickly and tries to address any concerns immediately.We are contemplating a return visit soon! Reviewed by R E Fejes"
We were lucky enough to stay for the month of February in 1804. Delightful, very well equipped and very relaxing with amazingly few people in the pools. Lanai time is wonderful with the occasional whale/dolphin show as well as boarders and boats. Traditional beaches(Hapuna, Mauna Kea) are an hour away and traffic has gotten worse over the years, but the drive is worth it. Grocery store within walking range and all Big Island attractions within driving range. It was a wonderful month. This was our first time renting a condo, but we had very high expectations. This unit met and exceeded our expectations in every way! Absolutely beautifully decorated and appointed. Spotlessly clean and comfortable. Incredibly well appointed, from beach towels to boogie boards, everything we needed was there. When the only suggestion for improvement I can think of is a third towel bar in the second bathroom, you know they thought of everything! Comfortably fit the five of us, and the huge bright kitchen was a major plus. This condo was hard to leave! Every member of our family fell in love with the place. The complex is very nice, beautifully landscaped. The staff that we interacted with were professional. The ocean pool is lovely. Units do not have Bbqs, but there is a great high-end shared gas grill just a few steps from the unit. I did wish that there were easier access to a beach where we could walk in the waves. The shoreline at the complex is extremely rocky, and the water itself is not easily accessed from the units. However, this unit is probably the very best in the complex for excellent view and ultimate privacy, with the sound of the waves being the only noise we heard. Kathy was very helpful in the planning our trip. Thank you! We'll definitely be back. Our favorite place we have stayed in Hawaii! Beautiful condo, beautiful views, great location, and nice complex with 3 pools, tennis courts, etc. We have been to Hawaii about 10 times over the years and this is the best condo we have ever stayed in. The view is priceless! A perfect place and location for a totally relaxing vacation. The condo is beautiful and the location is spectacular...a place that one can return to and always enjoy. Absolutely the best condo on the property! We've stayed in various condos at Kanaloa since the late 80's and have never stayed in such a beatifully decorated, well maintained unit as yours, Kathy. The location was supurb with just enough surf to block out all extranious noise and make sleeping a dream. The location at the north end of the property was perfect for breezes to keep away any vog and cooling. The only thing missing was a quality restaurant like Edwards and hopefully soon someone will open one, at least for a good local breakfast. Being a real estate broker, it was so refreshing doing business with you, Kathy. You were always right to the point and did what you said you'd do - quite a rarity today! Hope to see you again with more members of the family soon. Reviewed by Colorado loves Hawaii! This was our first trip to the Big Island and we just can't wait to go back! The condo was one of the highlights to our trip. It was absolutly amazing, beautiful, clean and more than we imagined! We can and will highly recommend this condo to everyone. Kathy was amazing and the gift basket was an amazing thoughtful touch. The best! This is the nicest condo we have stayed in at Kanaloa. It was very well suited for a family with 3 school age children but also grown up enough to host other adult families to dinner. All the amenities and supplies you could need from boogie boards, coolers etc. were all stocked and very close to a BBQ and the ocean-side swimming pool. The location is perfect - close to Kahalu'u beach for snorkeling, the shopping center for supplies and farmer's market, and Keahou Bay for catching the Trade Winds II trip. Best of it is so quiet and restful. We had stayed at other units in the Kanaloa complex previously; really enjoyed the location of this complex, and knew that this particular unit had the best views of any available. We were not dissappointed upon our arrival with any aspect of the unit and the fact that the lanai view was dead on the ocean with perfect sunsets every evening made our month-long stay truly wonderful. This ia fabulous condo. It is very spacious, well kept, nice furnishings. The views from the living room are fantastic, Lamai overlookks ocean which is only yards away! We enjoyed watching many sunsets from the Lania, having breakfast many mornings out there as well. Condo is supplied with almost anything you would need include coolers, beach chairs, spices... The location is great- you are not in the middle of the busy part of Kona, but a short drive away. The resort itself is also very nice. Very nice pools, tennis courts, grills. I would have this place tops of my list to stay when we go to Kona again. Kathy made it very easy to transact business - a big Mahalo! We have vistited all the Hawaiian Islands and keep returning to Kona for the diveristy and Kharma the Big Island offers. If you are searching for a luxury condo on the Kona Coast of Hawaii with a fabulous ocean view, then this is the condo for you. This second floor condo has sweeping views and sits only yards from the ocean. The location is excellent, and the resort is lovely. There is plenty of room in this condo for you and your family, and central air conditioning is available. The kitchen is well-stocked and appointed. A new front-loading washer and dryer are also in the condo which is very convenient. I would highly recommend this condo to anyone traveling to the Big Island. This condo has a lot of upgrades. Kanaloa has very nice condos to begin with, and this one is outstanding. Tile throughout, and marble tile in the master bathroom. Walk in double shower with a separate huge jacuzzi tub. Walk in closets. Huge flatscreen TV, big kitchen that looks like it was remodeled in the last few years. A good size lanai, beachfront or lava front. Can watch sunsets from the lanai. We have stayed in several of the condos at Kanaloa and is this is by far the nicest one. Sleeps up to 6 and has 2 full bathrooms. Kanaloa is the nicest condo to stay in Keauhou Kona. This is an absolutely awesome place to stay. It is nice and roomy and it has been nicely remodeled. We felt absolutely at home. The kitchen is well equipped. The only thing missing was a muffin pan. And there are plenty of beach items...boogie boards, ice chests, beach towels, beach umbrellas, chairs, etc. The only negative thing I can say about the condo is the bed in the master bedroom. While the mattress was very comfortable, the box springs must be extremely old. The springs creaked every time we turned over in the bed. It was extremely noisy. I like to get up early and my husband likes to sleep in. I was unable to get out of bed without waking him every morning. We used ear plugs the rest of the week but it didn't completely drown the noise. Other than that, it is an unbelievable condo, with absolutely gorgeous views. The lanai was my favorite place every morning. And it is a wonderful place to watch the stunning sunsets over the ocean. We would definitely stay here again. This was our second stay at 1804 and we had a great time. We enjoyed the condo so much last summer we had to get back again this summer. We will stay at this unit for a long time. Everything is great: the view, the overall layout of the unit, the privacy, the ocean waves and sounds, and the ease of booking. Views were spectacular. Condo was very spacious and very clean. It was beautifully upgraded- hardwood and slate floors,granite countertops, spalike feel to the bathrooms. Decoratating was lovely- tropical without looking tacky. Nice to have the air conditioning (extra charge for this). Kitchen was well stocked. The three pools were nice, One disappointment- no workout room.There was lots to do on the island and we would definitely come back. The condo was very roomy for our 3. We found ourselves on the veranda (staring at the ocean) anytime we were back from outings. Master bedroom & bath are amazing. We utilized the chairs and beach pads, the cooler for a picnic lunch on one snorkling day, watched all 3 Harry Potter DVDs in the entertainment cabinet, walked across the golf course+ to snorkle each morning. We traveled only with backpacks since the condo had W&D so washing kept our packs small. Kitchen was very up-to-date and clean. Next trip to the Big Island, we will be back. Our stay was just about perfect!!! I would recommend a/c, though, because of theafternoon Western exposure....the sun warmed thecondo significantly in the afternoons; nights andmornings were very comfortable, with the windowsopen and fans blowing, but late afternoon got pretty warm! It was our choice, but next timewe would get a/c. If we are able to return, this is definitely wherewe would stay! We stayed here for our 25th wedding anniversary and totally enjoyed our stay in 1804. This condo is perfect for relaxing and listening to the waves crash against the lava rock. It has all the amenities you need and more. The condo has been totally renovated and is very modern and beautiful. The kitchen is a gourmet kitchen, granite countertops, stainless steel appliances. The master bath has a two shower head large shower and jacuzzi. The area is very quiet and peaceful. We rented 1804 for 10 days in October during "Ironman Week." The location was perfect, the views and sunsets were breathtaking and the condo had everything we needed. It was far enough away from downtown Kona to get away but close enough to be there in minutes. The unit was convenient to two great beaches where we snorkled and body surfed. It was also very convenient to a launch for incredible kayaking. The pool was convenient for a relaxing dip. We used the outside grill for cooking which was also great. If we ever return to the Big Island, we could not imagine staying anywhere else. We stayed here Sept. 26-Oct 3...there were two couples (we were celebrating both husbands' 50th b-days) and a 22-year-old son. The condo is very well equipped, comfortably furnished, and spacious enough. Lots of extras (ice chests, chairs, beach towels) so we didn't have to spend extra $$ or time getting these things. While it is about 20 minutes to downtown Kona or other attractions to the north, we enjoyed the peaceful and well-manicured setting of the complex and the awesome views of the kayakers, boaters, and crashing waves off the lanai! We would definately stay in this condo again. Thank you! Note: the restaurant and bar at the condo complex are no longer open. My wife and I took my mom here for her 65th b-day and it was great. Very clean and well taken care of. We are definately going to tell our friends about this place. This was our second time to 1804. We can't imagine ever staying anywhere else. Kathy clearly takes pride in the home she is willing to share. It is beautifully decorated, there are thoughtful items left for our use and the view...well it just doesn't get any better. I would recommend this unit to anyone. Awesome view, awesome accomodations. Everything you could possibly need in the kitchen. Comfy couch and big screen TV. Great to come home to at the end of a busy day, in fact, tough to leave sometimes. Just wanted to sit on the deck and listen to the ocean. Great sunsets! This condo is more than comfortably furnished and decorated as an upscale home. You must enjoy the sound of the surf as it can be heard from every room. No need to bring a thing but your personal items-everything else is made available to you. The Kanaloa location is convenient to lots of fun activities including a safe snorkeling area for children. Enjoy! This was our third stay and we seem to keep coming back to the same place. This is now our favorite island and favorite tip of the island. We loved it!! We were in Hawaii for my sister's wedding and stayed at this beautiful condo. We had never rented a vacation home before - had always stayed in hotels - but this was so great, we would definitely do it again. This unit is so close to the water, you can almost jump in from your lanai. The view is gorgeous! There is not a beach, as it is a rocky shoreline but if you are looking for a clean, spacious, nicely decorated and well maintained condo where you can relax, listen to the surf and enjoy spectacular ocean views, this is a wonderful choice. There is a golf course here, but we don't golf, so we didn't try out the course. The pool was nice for the days that we just wanted to lay in the sun for awhile. We did, of course, do alot of sightseeing and it was great to come back to a quiet, laid back, peaceful place and just chill. Paradise!!! This condo is great! The unit itself is beautiful, very tastefully decorated and extremely well maintained. The ocean-front location within the property is very nice - away from the center of the project, so privacy is enhanced. As a friend said of this unit 3 years ago, if you were any closer to the water, you'd need a boat. We've stayed in several different Kanaloa units, and more than once in this condo. All have been very enjoyable; however, unit 1804 has been the best - by virtue of location, being ocean-front, and unit decor, furnishings, and maintenance. I keep saying I'll be very happy to just stay and relax at this condo for the vacation, but activities invariably draw us out. Kanaloa at Kona is a wonderful location in the Keauhou Resort area of the Kona Coast. It's only 15 minute drive to Kailua-Kona town; and less than 5 minutes to one of the best snorkeling beaches (Kahalu'u Beach Park)along the Kona coast. The location is also 5 minutes from the Fair Wind and Sea Paradise snorkeling boat operations. We've also stayed at the Waikoloa area that's about 20-25 miles north of Kailua Kona, but the recent growth of condos in that area has greatly increased the population density. And it's usually windy there - the local nickname is "Waikablowa." And, the Waikoloa location assures you a 30-45 minute drive to come to town - or to get anywhere. So, our recommendation, when asked, is to stay at Kanaloa at Kona in the Keauhou Resort area, in unit 1804 if it's available. This condo was great! We were 2 couples, with room for more. Everything was exceptional, from the furniture to the fabulos master bathroom. It is right on the ocean, and best of all--------it has air-conditioning, because Hawaii can be very hot and humid. Nice gated community. Good pools, and even one for adults only, so there is no screaming kids to deal with. We have stayed in this condo community 2 others times, but stayed at different condos--this one is by far the nicest one. Every time we come to The Big Island we will stay in this community. We stayed at this condo while on Hawaii for a few days. It is in a very good location, the oceanfront views are wonderful, and it is very well maintained and beautifully appointed. The only down side was the loft where our "fifth" person slept was a bit warm and stuffy. The owner is very responsive.I'd stay there again. Beautiful oceanfront view with very nice new décor. The kitchen is well equiped, and the condo is very spacious and family friendly. Extreamly enjoed about the condo during 2 weeks staying with my wife. Alldays in the morning and sunset, watched ocean and sky with meal. Your condo gave us quiet and relax time without any concernings. The views of the ocean are spectacular at this property. We particularly enjoyed sitting on the lanai and the ocean view from there. The condo had everything we needed to feel at home during our stay. Additionally, the bathrooms are very luxurious and the furnishings/decor are beautiful. I highly recommend this condo as it has everything that you would want for a Hawaiian vacation rental property! This unit was decorated in such good taste and so clean. The beauty is that is is steps from the surf. The views and serenity were awe inspiring. Hearing the ocean each night was relaxing and special. The resort has three pools-so no crowds anywhere.We are hoping to return soon. Absolutely beautiful oceanfront condo, so close to the breaking waves that you feel like you are on a cruise ship. Views are spectacular, condo is well appointed and beautifully decorated. Owner seems dedicated to making sure that every need is met. This is an outstanding condo. It appeared to have been recently ungraded. We stayed with friends and all agreed this was the best place we have stayed at Kanaloa At Kona. I am sure we will return. Absolutely a great unit. Top of the line furnishings and decor. Well stocked with just about anything you would need. An extremely enjoyable place to stay!! What an incredibly well equipped, clean condo with a most spectacular view of the ocean. It has to be one of the best locations on the Big Island. Well worth the money! We have stayed elsewhere in Kona but this takes the cake! Comfortable beds, furniture,every mod con, beach stuff for the kids. Lovely quiet complex, good restaurant for breakfast, lunch, three pools. No letdown here! Hope we'll be back!